Place sliced shallots in a small dish. Cover them with vinegar and let sit for 10-15 minutes. Pull all the dark green endive leaves and discard. Then cut or break off the remaining leaves, wash in cold water with the chives and chervil or parsley, dry with a spinner or cloth, and place in a large salad bowl. Cook the beans in salted, boiling water until tender (about 8 minutes) then drain and allow to cool. Then add them to the salad. Remove the outer leaves of the Boston lettuce, wash them, and cut them into eight pieces. Add these to the bowl. 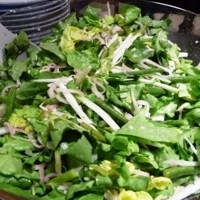 To make the dressing, remove the shallots from the vinegar and sprinkle them over the salad leaves. Put 4 Tbsp of the left over vinegar into a medium bowl and add the mustard, garlic, a pinch of salt and whisk in the oil until the dressing emulsifies. Taste and correct for seasoning. Add the dressing to the salad, toss, and serve immediately. For presentation, you can leave the undressed salad on the table with the dressing next to it and dress just before serving. This is a great side salad. I love the warm, tender green beans and the tangy mustard vinaigrette! Sounds delicious and perfect for spring time. Can't wait to start eating salads regularly again! I love this green salad so much, perfect . . . This looks and sounds wonderful Nancy!